Samsung has taken Galaxy S8 to whole new level in terms of design. The infinity display looks wonderful on the phone which was possible due to removable of Home button. Yes, that is true. Now you won’t be seeing physical home button on the phone. Instead the keys are moved to the screen which can be said as soft keys. Due to removal of home button the process of hard reset has also been changed. Hard reset Samsung Galaxy S8 is a term used in the smartphone world to describe forcing your device to reset to it is factory settings. We will show you how to perform a hard reset on a Samsung Galaxy S8 or S8 Plus if ever necessary. If you are facing certain issue on your Samsung Galaxy S8 or S8 plus, then you need to performance hard rest on your devices. Then you are at the right place to learn how you can hard reset Samsung Galaxy S8. Here are the steps of the process in the details. NOTE: Hard reset Samsung Galaxy S8 will erase all data stored on your device. It is advised to back up your data before factory reset your Samsung Galaxy S8. All described operations you are doing is at your own risk. Step 1 ====> First turn off the phone completely. Step 2 ====> Press and hold volume up button, bixby button and power button together until the device turns on and you see Samsung Logo. Step 3 ====> Now Remove your fingers from the buttons. 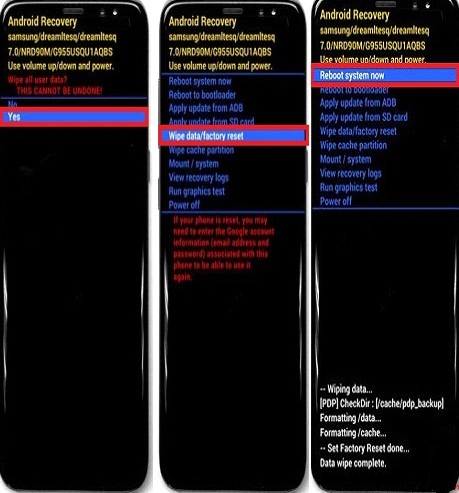 Step 4 ====> Wait few seconds, you will see different screen and you will finally enter into recovery mode. Recovery Mode will appear with many options. Step 5 ====> Use volume up and down to control the screen and power button to select the option. Select wipe data/factory reset then press power button. Step 6 ====> Again select yes option and press ok (It will then start hard resetting the phone). A message will appear at the bottom of the screen after the completion of process stating Data wipe complete. Step 7 ====> Select reboot system now, press power button (It will start rebooting your device). Once the process is finished, you have to set up all the stuff from the beginning just like you do when you get the new phone. Step 1 ====> Get another device connected to the internet and go to Samsung Find My Mobile web page (https://findmymobile.samsung.com). Step 2 ====> Next login with your Samsung account details, these include your mobile number or email address and your password. Step 3 ====> Now search for your device on the page and then make sure that both the Remote Controls and also the Connection statuses are turned on. Step 4 ====> Next, look for the Unlock My Screen option and tap on it. Then tap on the Unlock button on the right side of the screen. Step 5 ====> After that, you should be able to unlock your Samsung Galaxy S8 or Galaxy S8 Plus with just a swipe. The password which was set on your device before will be removed and swipe is all you need to unlock your device. In a case where you cannot access the Find My Mobile feature, the only left option for you is to hard reset Samsung Galaxy S8 or S8 Plus. So, as I said the process is easy and simple, right? Now, you have learned how to hard reset Samsung Galaxy S8 and Galaxy S8 Plus.